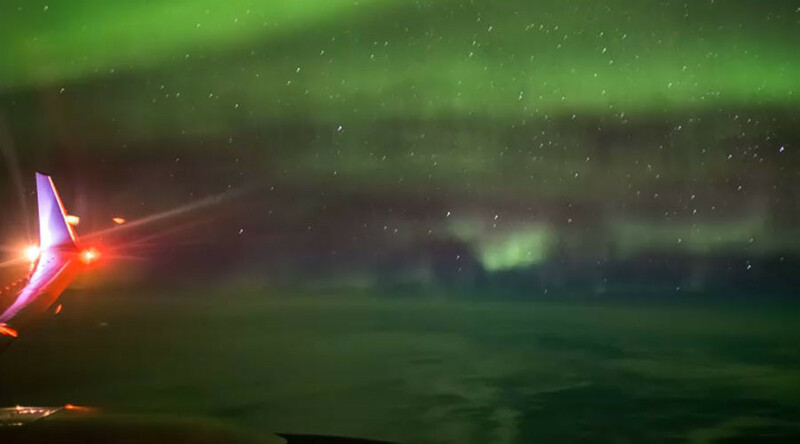 Spectacular video of the Northern Lights filmed from an airplane gives an incredible and unique view of one of the planet’s greatest spectacles. Aryeh Nirenberg captured the display of lights on a flight from New York to Reykjavik, Iceland, from an altitude of 35,000ft (10,700 meters). “I had a whole row to myself so I set up my Nikon D810 with a tripod at the plane window and captured this footage.” he said. Nirenberg’s video has proved popular online with more than 250,000 views on YouTube. “I've seen the Northern lights, but not like this. That's so beautiful.” one commenter said of the video, joining scores of others gushing at the marvel of the natural wonder. Not to be outdone by Nirenberg, NASA captured the Northern Lights from an even higher location last year. Using infrared satellite in space, the agency captured the colorful phenomenon as it stretched over Canada. The renowned natural phenomenon is typically witnessed in the Subarctic region, but can at times be seen further south in the Northern Hemisphere including Scotland and Ireland, depending on weather conditions.